On the way from Luxor to the Valley of the Kings on the West Bank of the Nile one passes two huge statues known as the Colossi of Memnon. The statues are nearly 60 feet tall, and once stood at the entrance to the funerary temple of Amenhotep III (also known as Amenophis III). With their crowns, each statue would have been about 66 feet tall. Amenhotep III ruled Egypt during the 18th Dynasty (14th century B.C.). During the time of the Roman Empire the statues were mistakenly associated with “Memnon, son of Eos and Tithonus, who was killed by Achilles during the Trojan War” (Baedeker’s Egypt). 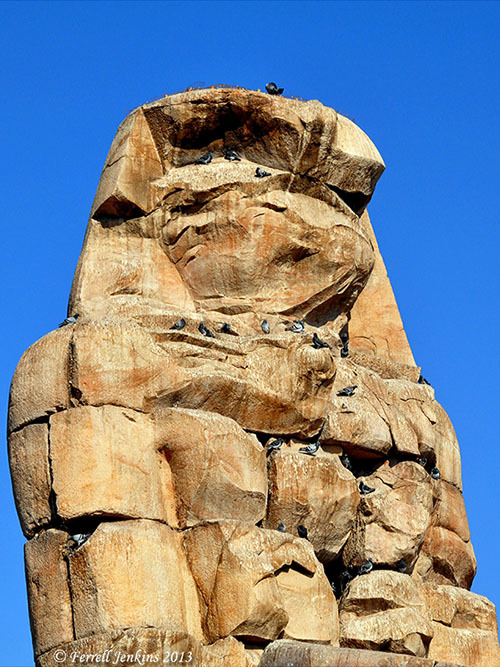 The last time I was in the Valley of the Kings I noticed the head and chest of the statue had become a resting place for birds. Just an interesting picture, I thought. Statue of Amenhotep III (or Amenophis III) on West Bank of Nile at Thebes (Luxor). Photo by Ferrell Jenkins. Whether covered by sand or birds, this illustrates how the “mighty” are esteemed by many who follow. Don’t take yourself too seriously! This entry was posted in Archaeology, Bible Lands, Egypt, New Testament, Photography, Travel and tagged Apostle Paul. Bookmark the permalink. Great reminder, Ferrell. Thanks! I remember hearing that Churchill didn’t want a statue of himself erected in London because he didn’t want pigeons to drop their droppings on it. Actually, Paul had a lot to say about this exact topic.